School children across Yorkshire have completed a 400-mile cycle relay, designed to promote riding as a ‘fun and cool’ method of transport. The Schools Yorkshire Tour was organised by Leeds City Council, in partnership with participating authorities across the county, and aimed to show how cycling can become part of everyday life. The tour also set out to help children, parents and schools realise that they can cycle around their local areas and communities safely by using new and existing cycling infrastructure. The tour started in North Yorkshire and passed through East Riding, York, Doncaster, Rotherham, Sheffield, Barnsley, Wakefield, Kirklees, Bradford and Calderdale before finishing in Leeds. 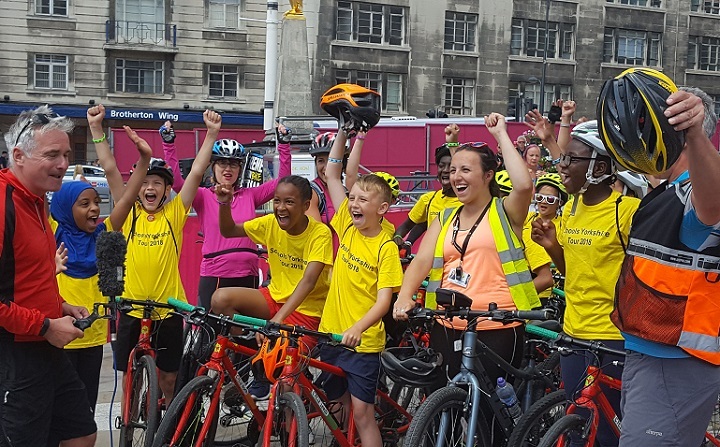 The final stage of the tour on 3 July saw pupils travel down a new section of the Cycle Superhighway in Leeds, created to provide a cycle route protected from traffic between Seacroft and the city centre. This was followed by a celebration event at Leeds Civic Hall which was attended by representatives from each school which has taken part. Leeds City Council says increasing the number of pupils cycling safely to school on a daily basis would help reduce congestion outside schools and improve air quality. Cllr Lisa Mulherin, Leeds City Council’s executive member for children and families, said: “The Schools Yorkshire Tour welcome event gave the children who’ve taken part a chance to meet and celebrate what they have achieved. Cllr Richard Lewis, Leeds City Council’s executive member for regeneration, transport and planning, said: “Our sustainable travel team have done a fantastic job pulling this tour together with all our partners from across the region. “By working together we can encourage more young people to take up cycling both as a fun activity but also as a way to get to school. This was a truly brilliant event. The organisers, supporters and volunteers should be congratulated.